Samsung Galaxy S8 had released in the second quarter of 2017, Samsung Galaxy S9 will be available in the market from the first week of March. Internet was filled with the news of this new mobile. S series is one of the most beloved outcomes of Android industry and when there are rumors about such jam-packed features, people are bound to talk. If you are waiting for the phone, then wait for few more days to get S9 mobile into your hands. The phone is available in Midnight Black, Coral Blue, Titanium Gray and Lilac Purple colors. The device has a Super AMOLED capacitive touch display which is said to be one of the best display technologies invented till date. It has a screen size of 5.8 inches’ and has Quad HD display type. It also has a resolution of 1440 x 2960 pixels with a pixel density of 570 pixels per inches. The resolution isn’t improving much however, the display is improved a lot. It features 3D touch technology which is going to be the next thing of the tech generation. Samsung provides Corning Gorilla Glass 5 protection for the screen. Samsung Galaxy S9 is running on an Android version 8.0 Oreo and is powered by latest Snapdragon 845 chipset from Qualcomm. It has an octa-core processor along with an Adreno 630 GPU set. In order to offer a fast multi-tasking opportunity, it provides a 4GB RAM along with a 64/128/256GB internal memory which can be further expanded by upto 256GB with the help of an external memory card. Also, it has a fingerprint scanner located on the back and provided iris scanning technology for fast and secure unlocking to the users. Given the configuration, we can expect Samsung Galaxy S9 will provide users with a lag free and smooth operating experience. Galaxy S9 sports a dual rear camera along with dual LED flash for better capturing of low light images. The rear camera is of 12 MP while the front camera is of 8 MP in terms of resolving power. The phone supports all kind of audio and video formats that are currently doing rounds on the internet. MP3, eAAC+, WAV, Flac, Xvid, MP4, H.264 are just some of the audio and video formats supported by Samsung Galaxy S9. This mobile has radio and loudspeakers too. The phone is coming with some of the most amazing features that are available in the Android world, hence it came with an awesome battery backup which will allow the users to keep going on and on with the phone. It won't disappoint for sure. It comes with a non-removable Li-ion 3000mAh battery. It also has quick charging technology which is already available in the predecessor Samsung Galaxy S7. As far as connectivity is concerned, the phone supports various connectivity options such as Wi-Fi 802.11 b/g/n, Bluetooth v5.0, headphone jack, GPRS, GPS, Edge, NFC and micro USB port. It has supports both 3G and 4G support features in place. The amazing hardware of Samsung Galaxy S9 will ensure that the phone provides the customers with a lag free and hassle free user experience. The camera is one of the best in industry and is bound to give the customers with an amazing capturing experience. No further development in the screen resolution. What networks will the phone be capable of connecting? The phone will connect to 4G LTE conforming to VoLTE networks with the support of 3G HSPA/UMTS and a 2G EDGE/GPRS cellular networks. Apart from that, the phone can also connect to wireless networks compliant to IEEE 802.11 a/b/g/n/ ac networks. How many memory variants does the phone have? The device would come in 3 memory options i.e 64GB, 128GB, and 256GB built-in storage, with 6/8GB LPDDR4 RAM, respectively. The memory can further be expandable upto 2TB via microSD card slot. What is the expected display type and size of the device? The Galaxy S9 will come with the same bezel-less display of 5.77inches with an aspect ratio of 18:5:9. It will have a Quad HD+ Super AMOLED screen type with 3D curved glass material. Will the phone comes with Dual-SIM support? The device is likely to come with 2 SIM variants i.e Single-SIM includes a nano SIM and a microSD slot, whereas the Dual version includes a nano SIM and a hybrid slot(either a microSD or a nano SIM). What is the expected date of Galaxy S9 to be launched? The Samsung Galaxy S9 is rumored to launched in January, 2018. Which chipset and processor will this device have? Rumours has that SoC will be powered by the new Qualcomm Snapdragon 845 chipset. Will this phone support Bixby button? Yes, the Galaxy S9 will have a dedicated bixby button with an improved personal voice assistance. What are the other miscellaneous connectivity options will it support? Which sensors will this phone have? The sensors of Galaxy S9 will have: Iris sensor, Pressure sensor, Accelerometer, Barometer, Fingerprint sensor, Gyro sensor, Geomagnetic sensor, Hall sensor, HR sensor, Proximity sensor, and RGB light sensor. Which OS will likely to be present in the phone? Will it receive OTA updates? The device will runs on the Android 8 Oreo based on Grace UI. Yes. it will receive an update to the latest Android OS, ‘Android v9.0 P’. What is the expected battery capacity of Galaxy S9? The phone is rumoured to be backed by a 3500 mAh battery capacity. The device will provide the talk time up to 24 hrs, 15 hrs of internal usage on WiFi and 14 hrs of internet usage on 4G. What security options will be present to make this device safer? There will be six authentication features like Iris Scanner, Fingerprint Scanner, Face Recognition for ‘Biometrics lock type’ security, and pattern, PIN, password for ‘Lock type’ security. Yes. It will have a support of fast charging, both wireless and wired type. How many pixels will the primary camera will have? Does it have Dual primary-cameras? On the back panel, the main lens will have a 16MP sensor with an f/1.7 aperture wide angle lens, while the secondary lens will have a 12MP sensor with f/2.4 aperture telephoto lens. The rear-camera features dual Optical Image Stabilization and 2x optical zoom. What will be the front camera specifications? The front camera will feature an 12 MP an AF camera with f/1.7 aperture lens for sharp, wide selfies. 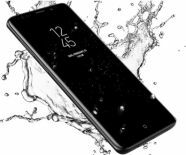 Are the Galaxy Galaxy S9 and its S-Pen water/dustproof? Yes. Both will have IP68 certified; That means you can submerge them in water up to a depth of 1.5 metres for 30 minutes. What key features of device will have? 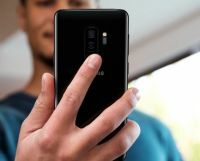 The Galaxy S9 features would have an infinity display, curved design, two rear-cameras, new and improved S-Pen, bixby assistant and a powerful processor. What will be the colour options for the device? There will have 4 beautiful colour options to choose from: Midnight Black, Maple Gold, Orchid Grey, Deep sea Blue. At what price Galaxy S9 will be launched? The Galaxy S9 expected price is around 2399 AED in Dubai, UAE.